I received this book from #kidlitexchange to read in exchange for an honest review. All opinions are my own. 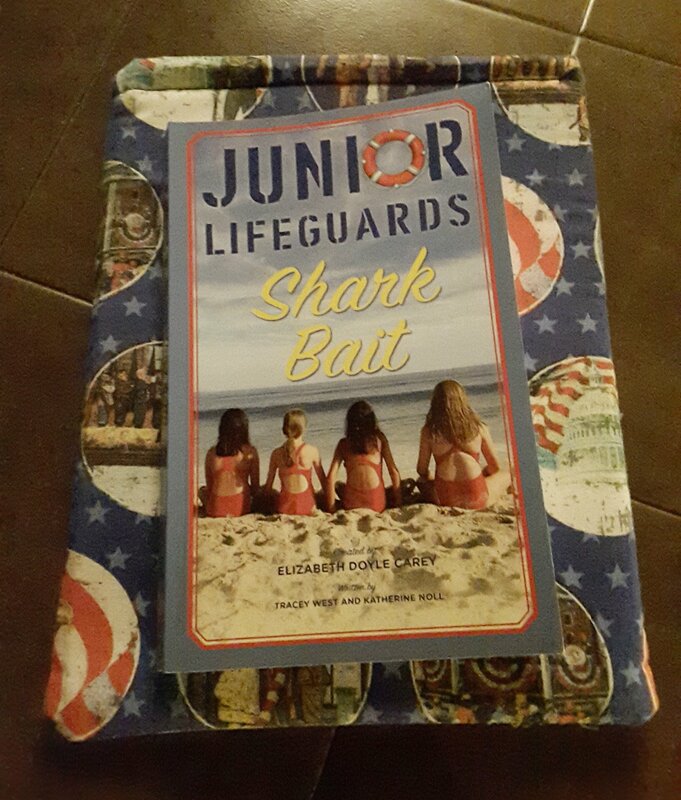 🌟🌟🌟🌟🌟Sharkbait (Junior Lifeguards Book 3) by Elizabeth Doyle Carey, Tracey West, and Katherine Noll. Piper and her friends have joined Junior Lifguards for the summer. Piper isn’t as confident as Jenna or Selena and it shows. She’s self conscious of wearing a swimsuit which leads to a mistake and a reprimand. A Sr. lifeguard, Jaime, is there with some great advice and confidence boosters. Piper gets assigned to shadow Sr. Lifeguard, Kevin, but Kevin has his cell phone and isn’t really paying attention and Piper is irritated. First rule No cellphones on the beach. She wiggled out of a second assignment with Kevin, but on day 3 Piper says she will keep watch. As she makes an amazing save Kevin gets reprimanded for not paying attention but Piper doesn’t tell he was on his phone. She doesn’t want to feel like a tattletale. But she tells Bud’s (the lifeguard leader) son who she has a crush on and he tells Bud. Kevin gets suspended. Piper worries and worries she’s done the wrong thing. In the end Piper realizes lifeguards must be confident and she can’t be afraid. She has to trust her instincts. Review also posted on Instagram @jasonnstacie, Library Thing, Goodreads/StacieBoren, Amazon, and Go Read.